Michel Kikoïne was born in 1892 in Gomel, Russia (now Belarus). Shortly after his birth, his parents moved to Rejitsa, near Vitebsk, where his grandfather was a rabbi and his father worked in a bank. In 1904, the Kikoïne family moved to Minsk, where Michel studied business for three years, meeting Soutine who then worked as an apprentice tailor. In 1908, Soutine and Kikoïne attended Kruger's Art Academy and then the School of Fine Arts in Vilnius, where they met Pinchus Krémègne, later becoming known as the 'Expressionist trio'. Kikoïne moved to Paris in 1912, enrolled at the École des Beaux-Arts in the studio of Cormon and in 1914 married Rosa Bunimovitz. Kikoïne settled at La Ruche, where Chagall and Krémègne were already living and Modigliani drew his portrait, c.1917. He mainly painted landscapes, still life, portraits, and expressive nudes. He participated in Salon exhibitions from 1914. His first solo exhibition took place after the war in 1919 at the Chéron Galery. Between 1922 and 1923, after a trip to Céret and Cagnes-sur-Mer with Soutine, Kikoïne painted expressionist landscapes. In 1927, he left La Ruche and settled in Montrouge but returned to Montparnasse in 1933. In 1939, Kikoïne was mobilized to serve at the Réserve near Soissons, where he painted gouaches of garrison life. In 1942, he and his family found refuge in the Toulouse area. After the war, he returned to Paris and in the last ten years of his life, frequently visited the Mediterranean Coast where he produced seascapes. Kikoïne died in his studio in Paris in 1968. 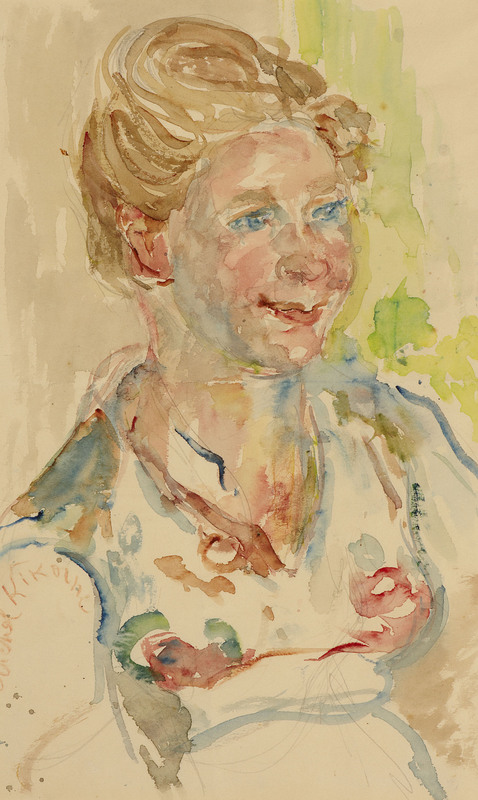 Kikoïne made three visits to Israel in 1950-51, 1953-54 and 1956 (his farewell visit) and his serene, smiling Israeli Girl, which employs a luminous palette and fluid use of watercolour, must have been painted during one of these visits.